Happy Friday and remember that this Sunday is Mother’s Day – be sure to make it a special day for her and as always tune in to That Business Show each weekday at 8am on 1250 WHNZ or listen live anywhere in the world on the iHeart Media app or online at http://www.tampabayradio.com. All shows streamed live in studio as well and a link to the stream is available at http://www.tampabayradio.com. 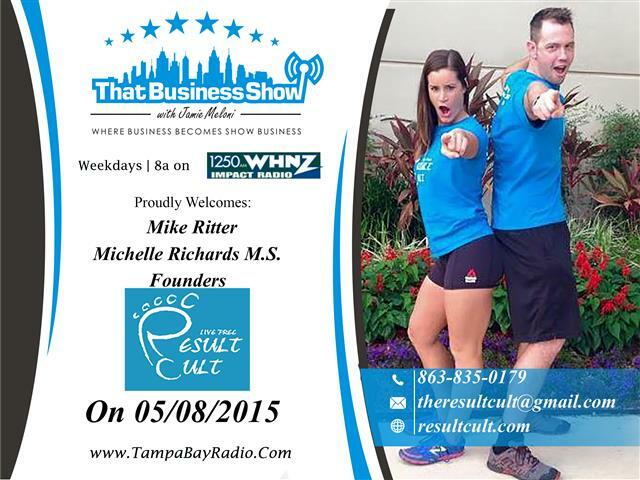 On the first half of the show, I spoke with Mike Ritter and Michelle Richards, two personal trainers at the Harbour Island Athletic Club and Founders of The Result Cult. Mike and Michelle were in studio today to share their stories of health and fitness and to inspire others to get back to our “human roots” so to speak. Michelle touched on the history of the human and what is means to be human noting that earlier man was much more active in their day to day routines and today we have a more lethargic lifestyle that has developed naturally due to technology. They touch on this point as well as many other health and wellness topics in their upcoming e-book, The Restoration Project. Talking points on this segment included a discussion on stress and Mike shares his story of his 45 pound weight loss through the Paleo diet and fitness and how both he and Michelle landed in the fitness industry. Learn more about The Result Cult at http://www.resultcult.com and feel free to contact them at 863-835-0179 or email at theresultcult@gmail.com for ways to get involved with them at the Harbour Island Athletic Club! I was joined in studio by Rolfe Arnhym, Ret. Lt. Colonel with the U.S. Army and author of the book, Start Everything Finish Nothing, The Curse of Modern Management. Rolfe has taken his life’s lessons in leadership and management and combined them into this informative and easy to read book and it is available on Amazon.Com as well as through his website http://www.starteverythingfinishnothing.com! Rolfe and I discussed ways to overcome obstacles such as the cliché, “you can’t do that” and he shares his story of how he got over one of those “you can’t do that” moments when he successfully orchestrated the move of the Army-Navy game to the Rose Bowl in 1983, something that had never been done before. Rolfe works daily with 46 CEOs through Vista Florida and has been surrounded by excellence his entire life both in the military and in private industry and touches on just a handful of tips for leadership in this segment. Rolfe stays active in the community through Leadereship Tampa Bay and we discuss the importance of relationship building versus networking as well as how one must first learn to follow before they can lead. 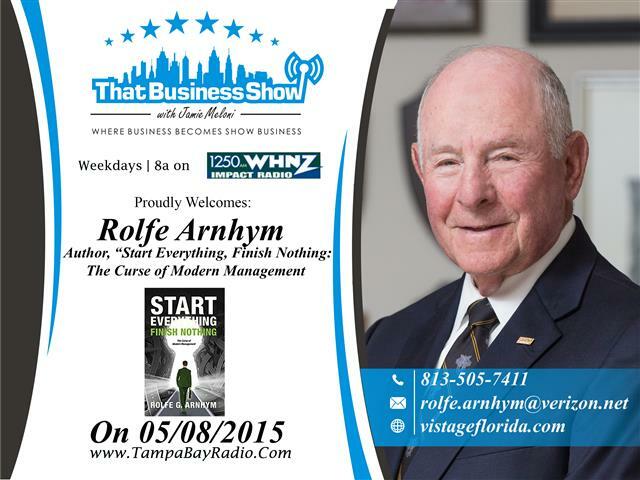 This is a great segment from an accomplished community leader and you can learn more about him at both http://www.vistageflorida.com and http://www.starteverythingfinishnothing.com and feel free to contact him at 813-505-7411 or email at rolfe.arnhym@verizon.net for your next speaking engagement!